Ok, I've been slacking off on posting pictures. They've added some good structure on the east end walkway, and you can see a bit of the design that will be there. More windows on the main entrance, and the south entrance has more structure for the circular concourse as well as for vertical brickwork. On the northside the second floor window steel structure looks to be close to complete. Maybe windows will go in this week. Here is a look from the northeast corner. They got to be looking at closing some of the open walls. With the first day of fall happening this weekend, fall weather (rain and frost) along with the occasional cold front blowing through the area it soon will be exposing the interior to the elements. Especially on the east side new upper level walkway/balcony. That is suppose to be functioning come this BB season. Anyone know how the interior work is coming along? I know there was a report on a quick tour maybe a month ago posted here. Thanks for posting the pics and keeping us up to date. You need to send these pics over to UD. The "Transform UD Arena" site has not been updated in over a year. Sad. Must have been busy working on the new website for the U.
I talked to a neighbor who is a fire fighter (more an inspector type now). He was inside about a month ago for an inspection/tour. He mentioned that there is a lot to be done, but they claim to be on schedule. There are also people on the job nearly 24/7. He also commented that Danis has a good reputation for pulling things together and finishing projects on time. I was in the Arena 3 weeks ago with UD Sports people .. I asked them if they will be completed on time .. they said yes ... they will be open on time. What I saw? Everything was opened up inside ... everything was unfinished. If something can be closed up for the games, they will reopen and continue completing until the next time ... to close up for the next game. I was told the new "Club" on the east side will be open in 2019. So this construction will continue and will be worked on after the start of the basketball season. Last edited by marco red eagle; 09-19-2018 at 09:38 PM.. Some years ago I was in Palo Alto the weekend after Thanksgiving....very late November. Stanford was playing ND in Stanford's 80,000 seat standium. All around the stadium was construction equipment. The next day, a Sunday, tear-down of the stadium began in prep for construction of a new ~ 60,000 seat stadium on the same site. In October of the next year, less than 12 months later, Stanford played its first game in the new stadium. Work went on seven days a week for ~ 10 months. That project makes our Arena redo look like a minor spruce-up. The last 20% always goes together quicker than the first 80%. The last 20% is the only part fans see anyway. I just hope they got the right grade bolts this time around after the first arena collapse. What I read in the DDN was that the wrong grade of bolts were used and these bolts sheared. The crappy design was confirmed when they said the center scoreboard could not be replaced because the structure couldn’t hold it. LED panels fixed that argument. My design criteria was to double what you need and then double that to prevent or reduce deflection. I need to drive over and walk around and maybe sneak in for a peak. Damm what did I do with the white hard hat? I read some time ago when Wernher von Braun and his team of German's engineers designed the Saturn rocket for Apollo they built it only in the manner they knew how. Over designed and well thought out. As the Apollo project wound up other folks in NASA discovered they needed more of "this" and plenty more of "that", the NASA guys would go back to von Braun and ask if the rocket could handle it .... his response always was " yes but only a little bit more". It was why that rocket never failed. I also worked on a team years back that dealt with space hardware. The reliability engineers stated that normal design would get you about 99% reliability at X cost while to get to 99.99% reliability would be 100X costing. It's how much you want to pay, how much you want to compromise and how much you don't know that will cost you in the end product. "The last 20% always goes together quicker than the first 80%. The last 20% is the only part fans see anyway." Obviously you have not been involved with software projects .. or Air Force projects ... or you are trying to be funny. The above statement is not what I have seen working finance for 40 years. But this is construction and out of my league. Last edited by marco red eagle; 09-20-2018 at 12:03 PM..
Watch Property Brothers. First six weeks the house is a wreck. Last five days it all comes together. Drywall, paint, appliances, flooring, etc go in quick. The 80/20 rule applies to most projects, construction or otherwise. That is the pressure gets turned up at the end to get it done. Many construction projects have bonuses or penalties based on finishing on time or early. Not sure about the UD project, but it is also high profile to the public, and to that construction company's reputation. I think there have been major advancements in building codes and inspection standards since 1968-69, when The Arena was first built. Plus, back then, the University operated on more of a shoestring budget, and society was not nearly as litigious as it is now. So, between advancements in construction & project funding, and the increase in class-action personal-injury lawsuits (leading to more emphasis on loss prevention), I don’t think UD is sparing much expense on this upgrade project. Initially, the design of the structure was called into question, and was immediately poo-pood. Had the design been faulty (including bolt grades), the review and redesign process would have taken months or years to occur. They were given the ok to continue the construction the next month after their investigation. The ultimate cause was determined to be faulty erection practices by the erector. When erecting large truss and girder structures, x-bracing, bridging and shoring is required to keep the structure upright. There was a wind event that night that caused the large trusses to twist due to inadequate bracing. That, in addition to lack of shoring on one of the main column lines ultimately caused the collapse. I haven’t seen anything about bolt grades or shearing being a factor. If there were sheared bolts, they were a product of the collapse, not the cause. There was absolutely no load applied to the structure. Oh, and bolt quantities have nothing to do with deflection. Member sizes do. I think my hard hat is white, I can’t tell from the stickers. Uncle Fester- You a UD Civil graduate? If so, what year? I attended UD my freshman year (73-74). Completed at Texas-Arlington, but UD was my home. Worked under Jim Courtright during the Frigidaire transition in the late 70’s, early 80’s. I recieved an internship in Dallas simply because I attended UD. The senior engineer was a UD grad. Gearing up to retire soon. The words erection and member sizes have been a continuous joke thru the years, especially when used around new female office workers not accustomed to construction verbiage. Jim Courtright that’s a name from the past. I worked for Gebhart during that transition and was responsible for the paint room, parts washers, heat treat. 1972 to 1980. For those of you unfamiliar with Gm culture... when they were building the engineering offices I observed the asst. bosses measuring their offices and their counterparts to make sure they weren’t cheated. There was a phone book on regulations on who got what. In plant engineering I was entitled to a desk, drawing board and a four drawer file cabinet. Move to process engineering and I got two desks and two drawer filing cabinet. Three engineers around the three sides of a triangular fake flower pot. So I stared at a black painted plywood wall. Some put up calendars or other BS. I got along really well with skilled trades. So one Sunday when no one was in they installed a four ft. Bookcase in front of my desk and painted black. I came in early and filled it up. The bosses didn’t notice until the other guys complained that they wanted one too. When asked I didn’t know how it got there. I drove around the arena Sunday and it looks like plenty of work still to be done. The east wing is coming along nicely. Windows on the first floor, and siding in the upper 400 walkway. On the south entrance, though, they haven't put in steel structure for the second floor windows. Hopefully, that's happening this week. 25 days until exhibition game. A couple more pics at Figstats. Just a reminder of the original design plans. I heard from good source that only one of the four party decks will be open this year. Sounded like they were going to let different groups rent and get feedback on set up, work out bugs, etc before they finalize the interior design of all 4. Good idea I think. Also (I think I have this correct) Of the four corner boards only two will be turned toward the upper arena, one on each side. They may be repositioned. Evidently the team/staff references those board during games. Last edited by Lifelong Flyer Fan; 10-09-2018 at 01:05 PM.. I also heard that only will turn two of the boards. Very interested in the party decks. Great idea. So I pulled into the arena lot today to make a few notes from a phone call I had just completed. At least 14 different scissor lifts and boom lifts with workers working on the exterior of the building, couple hundred vehicles in the lot that I assume belong to construction workers, and people everywhere. Looks like a lot left to be done, but appeared to be plenty of manpower on site. More importantly, anyone seen Drone video of what is going on? I did not see who was flying it, but was one buzzing overhead today that I assume was taking pictures or video. Last edited by ClaytonFlyerFan; 10-11-2018 at 12:16 PM.. If anyone ever attends trade shows, the convention floors look like a wreck one hour before the show still. Then it all comes together. Building construction is slightly different, but the concept of last minute push is the same. To give fans more time to get used to the changes, the arena will open two hours before tip-off — instead of one hour early — for the exhibition games, the women’s first regular-season games and the first couple of men’s regular-season games. Season-ticket holders also will receive maps with routes to their seats when their tickets are mailed in the next week to 10 days. The King denied my requisition form for a quad-copter with a camera, so it wasn't me. In the last week, north entrance doors have been installed, steel support for windows on the second floor of the south entrance, metal siding on the south side of the east walkway area, and windows installed in 4 of the 5 sections on the east wing. Here is a shot of the southeast area over the fencing closer to the arena. Sidewalks also look to have been poured in the last 2 weeks, must have missed that last week. A few more pics at Figstats. Wow. Amazing what can be done in 1 week. The north side seems to be complete, except for the missing posts in the concrete. And on the south side, windows are installed on the 2nd floor, as well as doors, and the brickwork is almost complete on the section between the entrance and the Donoher Center. The east side wing is missing some installed doors, posts, and maybe some painting of a logo. Not sure what changes I can capture next Sunday, maybe the fences will be gone, and the containers and trash cleaned up on the east side. I'm including the picture from the south east this week. It's a good comparison to the original design produced by UD. The siding, or lattice work, or whatever, that will go around the top of the 2nd floor, and have the name of the arena, isn't done yet, but that's pretty cosmetic. With the first games only 10 days away (Women's exhibition then Men's exhibition, Thursday and Friday next week respectively), I may only have 1 or 2 more updates for everyone. PS: If anyone knows anyone important who wants to let me inside to take photos, officially and legally, before the exhibitions, I'm all up for that. I'm not considered part of "The Press", so I have no ability to get in. Last edited by Figgie123; 10-28-2018 at 10:21 AM.. Ticket office for the south side is inside the newly constructed main entrance. 4 days to basketball at the newly remodeled UD Arena! And, with that, the winged-D logos are up on the south, east (twice) and north sides! Here is a shot of the south entrance, with the winged-D logo in the foreground. The other shots of the north, south, east, and closer southeast photos are at Figstats. Last edited by Figgie123; 10-28-2018 at 10:57 AM..
Wonder if the railing along the south side is to support a new "UD Arena" sign?? You can still see the old one up there. Does anyone know if this renovation caused any reduction in parking spots in A Lot? Both the north and south side have those "railings", and there will be horizontal railings, like a fence almost, put up, and the new (old?) 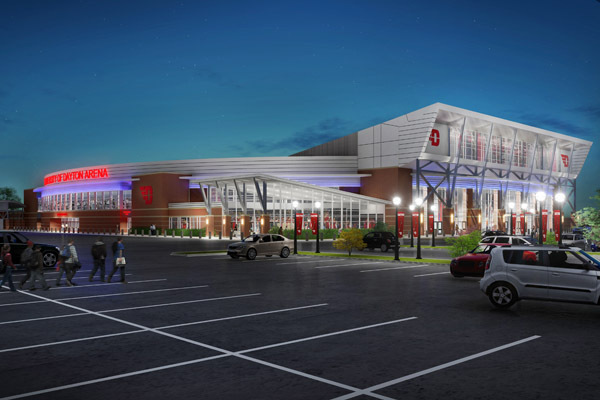 UD Arena namesake will be listed there. Go up earlier in this thread to see the design someone else posted. The only place that I can see that some spots might have been removed, would be in the small lot at the east wing entrance. I'm not sure if that's A lot, though, I thought it was B lot. This is because the entrance on the east wing has a curved sidewalk now at the entrance doors, so the lanes that used to go straight, would now have to be curved. With that said, they were power washing the sidewalks and pavement around the arena Sunday morning, so they may still have to paint the lane lines in that area still. Based on the actual photos and comparison to the design concept drawings it "appears" the large Winged D logos on the south and north sides are going to be back lit ... secondly the actual D "appears" to be slightly smaller than the concept drawings .... I use the horizontal non-red brick work as a base line to the bottom of the logo as the measure to gauge the size. The Winged D on the east facing upper level of the 400 sections don't appear to be back lit but are probably going to have external lighting played on them instead of back lit. All in all I thank Figgie for his attention to detail and his regular up-dates on the arena. You are correct. I have seen the D's on the upper level illuminated. Thank-you for all of your arena upgrade posts and pictures Figgie. They have been very informative and are greatly appreciated. This is like the best episode ever of Fixer Upper ! Are we still talking about basketball? I've seen them on the beach. Seriousy??? Do you even know the alphabet?? You don't know the difference between a D and an F?? Come on man . . . The first edition of "Arena Construction - Indoor Edition". Here is a photo of the southeast concourse walkway, which is behind the all glass wall entrance housing the ticket office, and the "Flyer'd Up" apparel store. The 'Dayton Basketball' words are right in front of the doors between the ticket office and the concourse. Yes in its plural form Basketballs !!! Thanks for blurring out my face and the kids lol. No one wants to see my ugly mug!!! For Dayton fans who think that the university of Dayton spent a lot of money on the renovations to the basketball arena; the university of Texas announced that they are spending 338 million on a new basketball facility. Today was my first exposure to the renovated Arena. The UF-grad wife was especially thankful of the indoor ticket office. Overall, I liked it. One negative, the concessions are very close to the entrance doors, creating a traffic jam pre-game with folks getting beer while others are coming in. The high back premium seats on the corners of the wings (above the 200 level) looked really nice. Are they going to have more than three sinks in the men's room, or do they expect most men don't wash their hands? Will any of the future improvements involve getting the info for the MVP announcements correct? Today, they mentioned that C-Dub was a 3-time MVP, and the season they posted on the widescreen was 2005-06. Um...he was a Junior AT TROTWOOD-MADISON THAT YEAR!!! Keith Waleskowski probably does, too. I’m waiting for them to post that Roosevelt Chapman won the award in 1988-89, five years after he led us to the Elite Eight AS A SENIOR. How were the windows during a day game? From my Christmas Break seat in the Pep Band, they seemed to make the Arena a more intimate place, making the top of the 400 level seem closer to the court than before. From my regular seat in 215, you don’t notice it as much. I thought it was very cool. It was a gray, cloudy day outside, so the effect wasn’t as good as it could have been, but I agree with TBone that it makes the Arena look more intimate. I’ve not been to Phog Allen Fieldhouse but from what I have seen on TV, it echoes that feel. I’ll be interested to see if a noon game on a bright sunny day causes any issues. I’ll bet they took that into account though. Couple things- I saw a game at Phog Allen a few years ago and while it has a little similarity, the Phog has a more “fieldhouse” feel to it. Also, I believe there are drapes that can be closed to block out any excess light at the Arena if needed. Windows were fine. Keep in mind they face east. Unless there is a 9:00 AM game in the summer, the sunlight should not be a problem. I live in Kansas and go to the Phog once a year. It is basically an oversized version of the old Fieldhouse. 16k People on bleacher seats in an area the size of the lower bowl. It is an incredible feel for a game - but facility wise when it is empty - it is nothing to write home about. Again much closer in look and feel to the old Fieldhouse then to the Arena. Besides being in the olde "Fieldhouse" back in 1968 I have been in some fieldhouse style (not to be confused with farmhouse style saison brew houses ) basketball facilities back in the day in different areas of the country. They all had a wide open, hi-ceiling feel as if they had been build as a hanger or military storage building. With people filling the seats it felt large even with a small but filled to capacity crowd. Some of these places were state run institutions. When I first stepped into the UD Fieldhouse (not for a game) it seemed large but not too large. It definitely shrunk when filled to overflowing for BB games and very intimate. For visiting teams it must have been very intimidating .... and it was. One negative, the concessions are very close to the entrance doors, creating a traffic jam pre-game with folks getting beer while others are coming in. And anyways, the only complaints I ever heard at UD was HOW LONG THE BEER LINE was, not that it interfered with anything else! Does anyone know if UD will be hanging any banners up once the renovation is complete? Those boards that hung on the wall were weak IMHO.